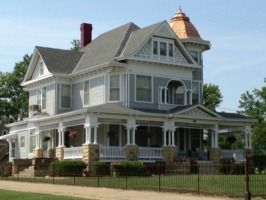 Rural Kansas Tourism | Minneapolis Exploration: Twin Houses? Israel Markley built each daughter a house. Being a wise father, the houses were identical. Now the observant explorer has to search for similarities. One house is located at the west end of Main Street. The large white Queen Anne house sits on the northwest corner of 2nd and Mill Streets. Lovingly cared for into the 1960's by Elmer and Annabelle Trout, the entry was completely carved and turned wood. Including a built-in bench, winding stairs, and beveled glass. At the landing of the stairs was a stained glass window. The twin house is located at 315 N. Rothsay. This home was remodeled and added on to by several of the owners. In the 1960s, the entry was identical to the house on Mill Street. At that time it was owned by Faye and Cail Collister, who added a fence to keep in their 2 great Danes. The current owners added to the historical legacy of the house when they purchased the iron fence from the cemetery and installed it around the perimeter.